"The power of Claus compels you!" "That's some good old-fashioned nightmare fuel!" Prepare yourself for a Big Brother Santa Claus fighting the evil forces of prancing demons with the help of child labor and Merlin. El Santo Claus was directed by Rene Cardona and written by Cardona and Adolfo Torres Portillo. The original film was produced in Mexico in 1959 and features primarily Spanish dialog. It depicts the adventures of Santa Claus in preparation for and during his annual Christmas rounds. 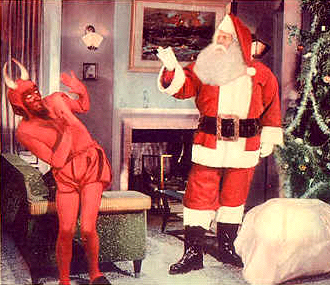 Most commercial adaptations of the Santa Claus legend add a distinctive twist to the traditional story, but this film trumps them all with its depiction of an interdimensional Santa doing battle with a demon sent to Earth by Lucifer to ruin Christmas by killing Santa and "making all the children of the Earth do evil." Furthermore, Merlin (yes, that Merlin) serves as Santa Claus' Q, inventing things like The Flower to Disappear for Santa to use. Believe it or not, there's a good explanation for the film's... unique take on Santa Claus. In the late 1950s, Santa Claus remained an unfamiliar figure in much of Mexico, where holiday gift-giving customs still focused on the Magi and their feast day, Epiphany (January 6). Even today, many discussions of Mexican Christmas customs make no mention of Santa Claus, instead focusing on such traditional holiday elements as posadas and piñatas. Santa has become more popular only in recent decades. Another odd running theme is the focus on social standing and class, which was a major concern of Mexico during that period; see Los Olvidados. A dubbed and slightly edited English-speaking version was produced for U.S. release in 1960 under the direction of K. Gordon Murray. Santa Claus was considered to be a financial success over several holiday-season theatrical releases in the 1960s and 1970s. Broadcast of the film also became a holiday tradition at several U.S. television stations. The film garnered at least one award, winning the Golden Gate Award for Best International Family Film at the San Francisco International Film Festival in 1959. A series of shorts by K. Gordon Murray mixed film from Santa Claus with new footage filmed at the various Santa's Village theme parks. These were riffed by RiffTrax as "Santa's Village of Madness". RedLetterMedia's Best of the Worst reviewed the full version of Santa Claus, which Rifftrax also riffed on December 4, 2014; both shows used the full version included Vulcan and other scenes that were edited out of the famous MST3K cut. Not to be confused with Santa Claus: The Movie. For the Mystery Science Theater 3000 version, please go to the episode recap page. It was also reviewed in the 2013 Christmas Episode of Best of the Worst. Alien Lunch: In a couple of odd As You Know moments, Pitch exposits to Lucifer about how demons eat red hot coals and Santa talks to one of his young helpers about how in the Fifth Dimension they eat "pastries and ice cream made from soft clouds." Aluminum Christmas Trees: The "Atomic Laboratory" requested in one child's letter to Santa is actually a real thing. It refers to the Gilbert U-238 Atomic Energy Laboratory , a child's chemistry set which included a small sample of (mostly) depleted Uranium-238. Due to the potential for radiation poisoning (and even more so the extremely hefty price tag note It retailed for $49.50 in 1950, the equivalent of $488 in today's dollars), the lab was not a commercial success unlike Gilbert's other offerings and was on the market for only about a year in 1950-51. Still the sheer WTF-ery of the idea made it a popular meme up to today. Americans Are Cowboys: All the kids from around the world hanging about Santa's workshop are decked out in the most stereotypical garb imaginable. Naturally, the two kids from the United States are wearing colorful plastic cowboy hats and "western" clothes. And That's Terrible: The narrator seems to believe the Viewers Are Morons since he is incapable of letting any of Pitch's shenanigans go without commentary and sometimes even admonishment. Another Dimension: Instead of the North Pole, this version of Santa lives on a Floating Continent in the Fifth Dimension. Arch-Enemy: Pitch is this to Santa. At the beginning of the movie Lucifer orders Pitch to capture Santa and ruin Christmas, and it's implied that Pitch is given this job every year. As You Know: Santa and Merlin go back and forth on how to use his various magic gadgets. Both keep pointing out how they should both really know all of this, but their memories are terrible. Bad Dreams: Pitch uses this as his primary method for enticing humans to sin. Most notably he uses this to try and make Lupita steal a doll. Badass Santa: With all of the powers that Santa has and with Merlin as his Q, Santa is able to defeat a centuries-old demon with ease, multiple times! Black and Gray Morality: Though as the film progresses, it descends into Gray and Gray Morality territory - see Moral Dissonance below for Santa, but Pitch seems less evil than intended. "Blind Idiot" Translation: The awkwardly-named Flower To Disappear is a good example of this. It's a literal translation of a pun that doesn't work in English, see Punny Name below. Crow: Oh, it's from Qaddafi! Camp: Pitch can out-effeminate HIM at times. Captain Obvious: The narrator, who describes every single thing that happens on screen. Carpet of Virility: Vulcan has what looks to be an actual fabric sample glued to his chest. Catapult Nightmare: Lupita has one of these. Mike: (as Lupita) I had the 'Nam dream again! Classical Mythology: Vulcan. In the English version he's referred to as "The Blacksmith". In the original version his name is "Llavón" (a play on the word "llave", key). Clockwork Creature: The reindeer which pull Santa's sleigh are this, complete with wind-up key. Cool and Unusual Punishment: If Pitch fails to capture Santa this year, Lucifer is going to force feed him chocolate ice cream: a double whammy punishment since not only is Pitch lactose intolerant he's also incapable of tolerating cold foods due to a usual diet of red hot coals. In the original version Lucifer threatens to dip Pitch in chocolate ice cream instead of feeding it to him, which is almost as bad. Creator Provincialism: Santa allegedly delivers gifts to all the children of the world, but we only see a few stops in Mexico City. Santa also has children from every country helping at his workshop, and naturally one of the Mexican kids is Santa's right-hand helper and gets more screen time than the others (of course that kid was also shown as part of the American and Spanish groups, so who the hell knows). Creepy Doll: Lupita has to face some of these in her Pitch-induced nightmare. Crystal Dragon Jesus: Santa Claus. The full version of the movie states that Santa is in fact a being from the Fifth Dimension. Culture Equals Costume: Santa's helpers, who are all dressed in stereotypical outfits according to their nationalities. Darkest Africa: How the kids from Africa are cringingly depicted. Disproportionate Retribution: Pitch's punishment, even if it wasn't done on purpose. He's soaked in water... in the snow. The Narrator brags about how he'll probably catch pneumonia. Given how Pitch is an Ineffectual Sympathetic Villain at worst, it comes off as a little mean-spirited. Evil Counterpart: Lucifer and Pitch as evil counterparts to Santa and Merlin, due to them sharing the same voice actors, respectively. The animatronic Santa doesn't sound jolly so much as this. The real Santa's laughs aren't much better. Pitch has an evil laugh of his own, but sadly it just doesn't compare. The clockwork reindeer as well. The Faceless: Lucifer, who never appears as anything but a booming voice and a burst of flames. Fantasy Kitchen Sink: Downplayed, but for the typical Santa elements, this film throws many other elements in there. Flaming Devil: Pitch, and Lucifer as well. Flash Step: Apparently, not only can demons teleport, but it sounds like a piano key being struck. The Fool: Pitch, basically. He bumbles his way through everything so ineptly that sometimes it seems like he wouldn't even be able to survive a trip to the grocery store without his magic. Gratuitous Japanese: One of Santa's kid helpers is a Japanese boy who speaks in unsubtitled Japanese. Goldfish Poop Gang: The trio of "bad boys" who plot to kidnap Santa. Good Is Not Nice: Santa, oddly enough. He's not above stooping to Pitch's level. Gosh Darn It to Heck! : Santa only curses this way, and yet he still apologizes when he loses his temper and does it in front of the kids. "Arggh! Blast it, darn that devil! Oh, I'm sorry, but that old devil is always annoying me with his mischief!" Hoist by His Own Petard: Pitch, at the end of the movie. So, Pitch has gotten Santa stuck in a tree and plans to expose him to the world. To do this he uses his dream powers to make a sleeping man sleep-call 911 and report a fire. The Fire Department arrives, sees the flames and smoke put off by Pitch, and hose the devil down. How Can Santa Deliver All Those Toys? : According to short films culled from the film, Santa uses the 5th dimension to be everywhere at once, so Merlin apparently discovered quantum entanglement and super-position. In the film, however, Santa visits three households before returning back to the North Pole. The movie actually attempts to retcon in the rest of the world; when Santa first gets to Mexico it's explicitly his first stop, then a little while later his helper mentions he's already been everywhere else. Santa who, as stated, is from the Fifth Dimension. Possibly Santa's helpers as well. They're said to be from Earth and are even given Earthly nationalities, but at the same time they seem to know very little about Earth, with one boy asking Santa about the types of food Earthlings eat and being shocked at the answer. Ineffectual Sympathetic Villain: Pitch. He was obviously intended to be evil, but his portrayal is really more buffoonish. Most of his shenanigans seem designed more to irritate Santa rather than capture or kill him, and in the end he manages to defeat himself purely by accident. Laughing Mad: That one laughing reindeer is by far the best example of this. Leg Cling: Santa, out of pity, appears in front of the Lonely Rich Kid... who then grabs Santa's boot and begs for someone to love him. Seriously, if you didn't feel a tug inside during this scene, you have no soul. Leitmotif: Pitch has one. Appropriately enough for a demonic servant of Lucifer himself, it's... a goofy-sounding bassoon piece. Tom Servo: (singing) It's the devil's theme... this goofy little song... even though he's the embodiment of evil, he's still got a goofy song... In tights, he brings death, despair, destruction and disease... come, let's all join in and laugh at him! DEVIL! Lonely Rich Kid: One of the subplots the film follows is a rich boy whose parents frequently ignore him to go out to parties, even on Christmas. Naturally, he writes a letter to Santa wishing for his parents to come home. Love Potion: A variation. Billy's parents are given a drink that makes them recall that which they love most, and it's their son. Lull Destruction: The narrator never shuts the Hell up. Makes Just as Much Sense in Context: Santa and his army of child laborers from the Fifth Dimension (assisted by Merlin) battle a demon sent by Lucifer to persuade the children of earth to do evil. That is the actual plot of this movie. Mall Santa: The animatronic Santa in the storefront. Oddly, some naughty kids attacking the animatronic Santa seem to somehow injure the real Santa too. The Man Behind the Man: Lucifer, whose only scene is ordering Pitch to capture Santa Claus. Moral Dissonance: Okay, so sure Santa is trying to make children happy and Pitch is trying to stop him. That said, Pitch doesn't seem that bad, he mostly just encourages kids to act out and disobey their parents, or commit minor crimes at worst. Meanwhile, Santa is given carte blanche to be just as wicked as Pitch, pulling the same shenanigans Pitch does back on the devil, and while he isn't directly responsible for Pitch getting soaked with water in the snow at the end, he and the narrator seem to be happy with that outcome. Narrator: A particularly obnoxious one, at that. Notable Original Music: Though mostly notable in that it's pretty bad. Not-So-Harmless Villain: Pitch spends most of the movie just pulling pathetic and often unsuccessful impish pranks. But at one point he decides he's through playing around and kicks it up a notch. He sabotages Santa's magic items, allowing Pitch to sick an angry dog on him and trap him in a tree, plants suggestions in the heads of people living nearby that Santa is a burglar out to murder them all (using one man's sleep-talking to put in a panicked call to the fire department), and stops by Lupita's house just to mock her for not having a doll because she wouldn't listen to him earlier. Oh, Crap! : Santa has one of these moments when he realizes his sleep powder and Flower To Disappear are gone... and there's a big dog coming right at him. Only Six Faces: The multinational groups of Santa's helpers are mostly the same few kids in different costumes. Our Demons Are Different: Pitch. He eats fire and brimstone, prances effeminately, and wears red tights. Pimped-Out Dress: Billy's mother wears a very fancy dress when going out. It has a beaded bodice, and pleats all around. Pretty in Mink: Billy's mother wears a silver mink wrap to go with her evening dress. Public Domain Soundtrack: Just count how many times "Jingle Bells" plays as background music. Punny Name: The Flower to Disappear was originally named in the Mexican version as "La Flor de No Te Veo" (the flower of "I can't see you"), which is a play on the phrase "no te veo" and "Nochebuena", the Spanish name for the Poinsettia. Public Domain Characters: Featuring a list of characters not typically in the same movie. Santa Claus, the title character. Merlin, who is basically playing a magical version of Q from James Bond. Satan, and his lesser demon minions who try to steal Christmas. Robe and Wizard Hat: Merlin wears these while working in his magic lab. Stop Trick: Done in very obvious fashions in scenes involving Pitch popping in and out of view. Synchronization: In one scene the naughty kids throw a rock at an animatronic Santa Claus in a store front... which causes the real Santa in his Fifth Dimension castle to recoil and shout in pain as if he had been hit himself. Santa's sleigh "almost ran into the Moon!" Sure it did, Narrator. You keep telling yourself that. Visiting about four houses in Mexico City apparently equals delivering toys to all the children on Earth. Though with Santa out of the way, and only children left to guard his castle, the resources Santa uses could indeed be used for much darker intentions than giving children presents. The Devil Is a Loser: Pitch fits this to a tee. Trickster Archetype: Pitch. Most of his attempts to stop Santa revolve around sneaky (if poorly considered) plots. Truth Serums: A variation is found in Santa's "Cocktail of Remembrance" which he gives to the rich boy's parents after they've left him alone at home to attend a dinner party. Pitch. They're pointy, and very big. Not to mention Santa's "earscope," a satellite dish with a giant plastic ear in the center. Unusually Uninteresting Sight: Lupita's reaction to seeing giant, evil dollies in her dream is... Dull Surprise. When You Coming Home, Dad? : The Lonely Rich Kid thinks this, if he doesn't actually say it.